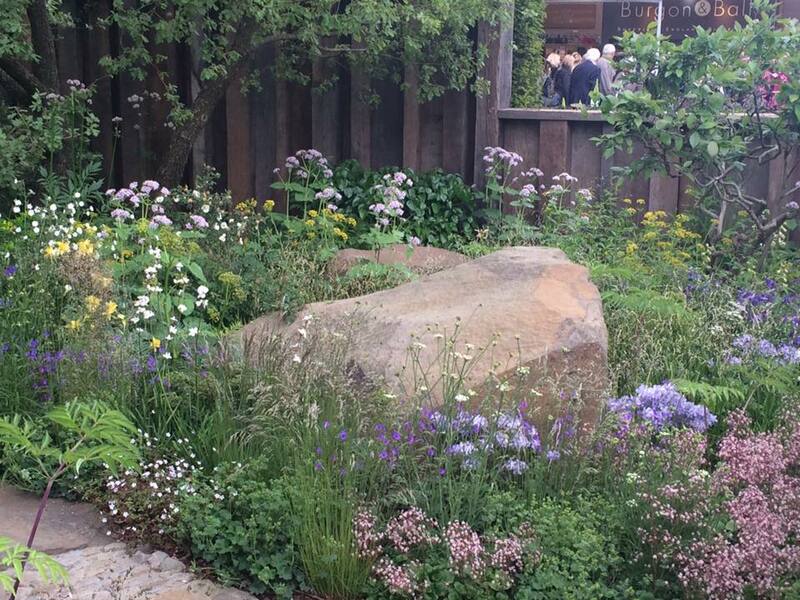 This week I headed down to Sloane Square with my mum for this year’s RHS Chelsea Flower Show. The weather was a bit crap – overcast and pretty chilly for a late May day – but given the crowds I was actually quite pleased not to be in the glare of a hot sun! First off we headed for the show gardens, and although at times given the volume of people it was hard to stop and ponder the planting, I really enjoyed the flowing, naturalistic planting schemes that seemed to prevail in the vast majority of the gardens. Wildflowers have definitely made a comeback, with ragged robin a popular choice, and it seemed most gardens were going for purples, whites and a variance on rusty orange or rusty pink. I suppose just like fashion, preferences for planting are subject to trends. But I like this recent trend. Pollinating flowers like alliums and salvias were in evidence everywhere, as was a certain type of almost milk chocolate-coloured California Iris. I think my favourite garden had to be the Botanic garden – not for its main feature, a glass house, but for one side of the garden that was planted up in a style that nodded to permaculture, with salvias, lupins, wild carrot, hyssop, beetroot, rhubarb, blackcurrant, gooseberry, french beans, nasturtiums, and all manner of fruit and veg crammed in together to create a bustling, thriving growing space. It definitely gave me lots of ideas for my own patch of the good life. The Greening Grey Britain garden was also an inspiration, with some almost prairie-like planting with swathes of plants that are perfect for pollinators, wildflowers including ragged robin and aquilegia (another popular feature in many gardens this year), grasses, and some gorgeous rusty metal bird seed cups that I haven’t been able to locate anywhere! 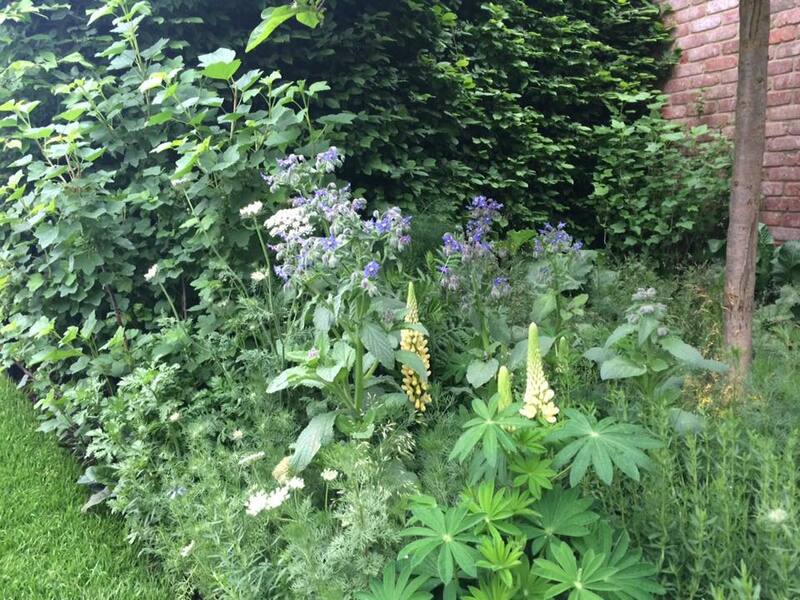 I love the idea of ‘Greening Grey Britain‘, an RHS scheme launched last year in a bid to overcome the paving over of front gardens, driveways and what could be thriving spaces for flora and fauna to reduce flooding, combat localised temperature rises and even subsidence. Want to make a contribution and bring colour and vitality back to the streets of Britain? Then visit the RHS site to make your promise. So lots of ideas and inspiration, and armed with three new packets of seed (two types of pollinator-friendly Astrantia, and some white ragged robin), I’ve come away determined to make the Smallest Smallholding a living, breathing and productive oasis in my part of suburbia. Naturalistic planting schemes were everywhere! Hi! 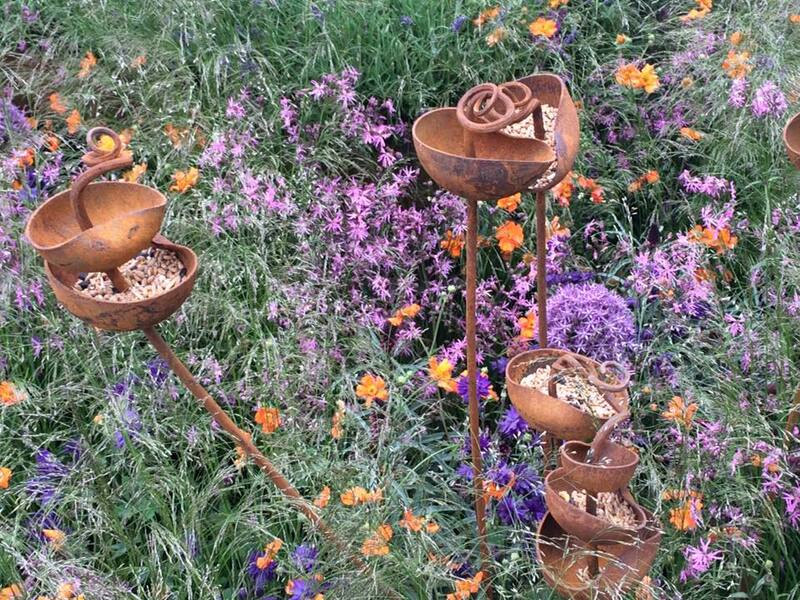 I just wanted to point out the sculptures are from here http://www.mooredesigns.co.uk/sculpture/ I came across your post in trying to find out the garden name for the sculptures for my own blog post 🙂 I’m in love with them as well!